To pre-cook the rice: Bring a large pot of salted water to a boil. 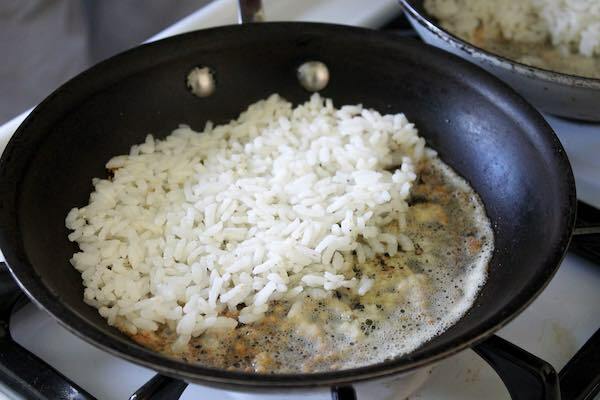 Add rice to the boiling water, and cook until al dente, approximately 12 minutes. Drain rice, and spread lightly with your fingers on a baking sheet to cool (this helps it retain its al dente texture). Allow to cool. To prepare the dish: Heat a small nonstick pan over medium to medium-high heat. Add butter to pan and warm until bubbly, browned, and nutty, about 4 minutes. Sprinkle grated pecorino to cover the bottom of the pan in a thin layer (like a pancake).Grind pepper over the pecorino using the coarsest setting of your pepper grinder or using a mortar and pestle.Then spread the cooked carnaroli into an even layer, about a 1/2” thick, over the cheese and pepper. Cook over medium to medium-high heat and let sit untouched like a riso al salto. You will think you are burning it, but let it be! Once the rice is beginning to cook, sprinkle on another layer of pecorino. You’ll begin to hear regular, loud cracking sounds from the cooking cheese and rice. Use a spoon to tamp down around the sides, and help the rice come together in a dish shape. Continue to let it crack away. When you can shake the pan and the rice cake is no longer stuck to the bottom of the pan, your dish is ready.